Oh wow, here we go, it's mid-October and I'm finally finishing my September Glam Bag review. I'm literally uploading this just days before my October bag lands in my lap! But hey, better late than never. Don't think my delay in posting had anything to do with the bag this month. Look at that colour! *Look at that GLAM! * Let's dive right in and see what I thought this month. God, I love this stuff. It's fantastic for people with sensitive skin, for whom a really thick, clogging moisturizer would cause super breakouts, but who still meed something to keep dry skin at bay. (My poor, thirsty, sensitive skin!) It doesn't have a discernable smell, yay, and works really well under a primer for putting on a day-face. This stuff is great, the brand is great, I dig it. I was confused when I opened my Glam Bag this month because this lip crayon looks EXACTLY like the eyeshadow crayon I got from Ipsy earlier in the summer. But no, this really was a lip crayon instead? I was a bit turned off at first but tested it out with last month's Lord & Berry lip liner and VOILA! A uber 90s neutral lip. Too bad this stuff smells like plastic and is hyper-drying though. So despite being pleasantly surprised by the shade (check my attached look! ), I have to give this lippie a pass. I will be searching for a similar colour from MAC or MUFE though. Brow products are hard enough to buy as it is, so I was a bit surprised to see one in my Glam Bag this month. This was the Light-Medium shade and it literally looked grey on my brow. Also it was really gunky despite trying to clean the awkwardly sized brush. I tested it on my boyfriend (he's great!) because he has much lighter, sparser brows than me, and despite matching his brows, it did NOTHING to enhance them. Disappointed! Binned. It's an Argan Oil, I'll use it. I literally never have to buy hair oil again because of all my beauty subscriptions so I will never complain about travel sized hair oils. It is a bit thick so keep it FAR AWAY from your scalp, but a tiny dime sized dollop will do the trick to tame your tips and help keep frizzies at bay. Now THIS IS WHAT I'M TALKING ABOUT. The rest of the bag was a bit of a crap-shoot this month, but this palette was soooo cute! I love the little bow, I love the shades and I love the creamy payoff. 1 is a nice champagne with shimmer, great as a highlighter, 2 is a sort of soft bronze and the black is a matte muted colour. It's a perfect fall colour spectrum, with just enough shimmer to be eyecatching. This was my first eyeshadow product from NYX and now I get it. I'm really excited for the NYX Cosmetics store to open in Toronto so I can bring home tons of product to play with. It's funny, just last week I was lamenting about how much I hate the whole 70s resurgence in fashion, but I feel like this bag is OH-SO-70s and I love it! Instead of fringe, it's ribbed, instead of taupe, it's gold. I'm definitely keeping this one. Less than optimal. I'm giving this bag a 2.5. 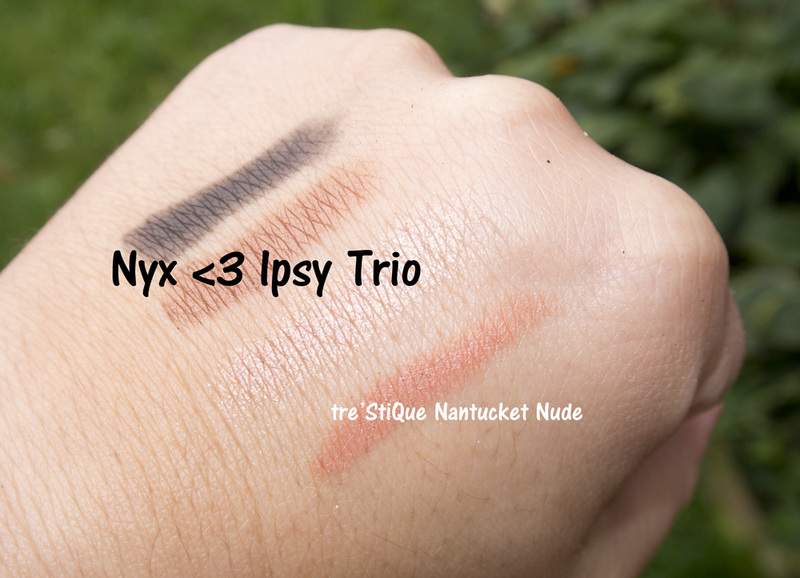 But I really did like the NYX eyeshadow trio and FAB is always a welcome addition to any bag. I just think Ipsy needs to ditch subpar brands like tre'StiQue and Elizabeth Mott as I've seen them in multiple beauty subs now and NONE of their products are every very good. If you'd like to test Ipsy out for yourself (stuff always gets very interesting near Christmas!) use my referral code here.